And just like that, Christmas is over and we’re back to regularly scheduled programming. Don’t mind me, I’ll probably continue to listen to Christmas tunes over the next week or so. Don’t think I can quit it cold turkey! While I’m sad my favorite holiday has come and gone, it’s time to look forward to a new year full of new opportunities, possibilities and triumphs. This week I have some free time to get organized and get my “office” space set up before my Marketing Assistant starts next week! I’m excited to have her on the team so I can delegate a little more of the behind-the-scenes stuff, so I can focus more on creating great content on here and on YouTube. For days when I’m working from home but have errands, meetings or other various activities or events going on, I like to be comfortable, but also look somewhat put together. The easiest solution this time of year is to opt for a comfortable pair of jeans, a cozy sweater and a sleek pair of over-the-knee boots. 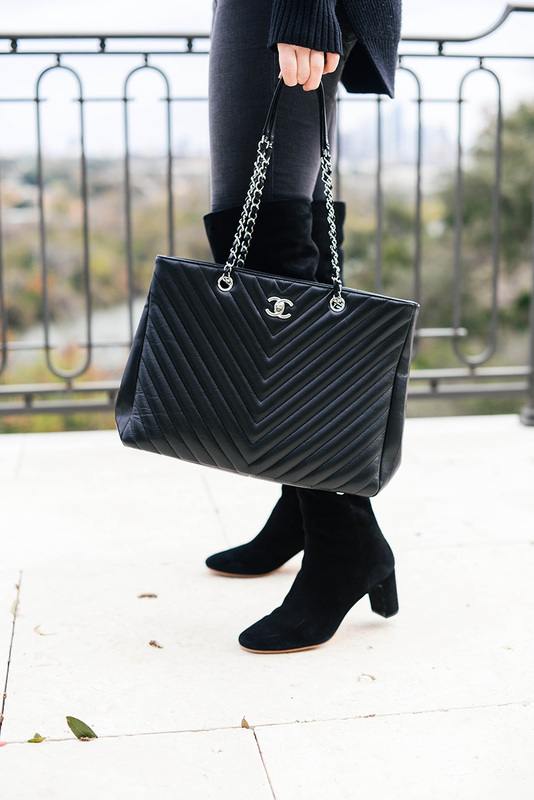 This heeled pair elevates any outfit, and is actually on major sale right now! They are comfortable all day, and look great with leggings, dresses, jeans, skirts and more. Definitely a versatile pair in my wardrobe! Just look to my Instagram for inspiration on how I’ve styled them recently. These boots make getting dressed on busy days a breeze. No wasted time pondering outfits or combing through my closet! For a casual pair to wear with jeans and leggings, try this Dolce Vita pair. Nearly identical to the popular Stuart Weitzman style, but way less expensive! These leather Rebecca Minkoff boots are now on sale for under $150! Looking for something to wear on date night? Try this heeled pair under $130. Another casual option for daytime is this pair, also by Dolce Vita. It comes in three neutral colors, looks so effortless, and is just under $200! Finally, this Steve Madden pair is only $99 and also gives you a double take for the Stuart Weitzman Highland. Love this classic look! Happy Monday, Merritt! Hard to believe Christmas is already over! I love this combo. It’s one I go to often, and you make it look so chic!